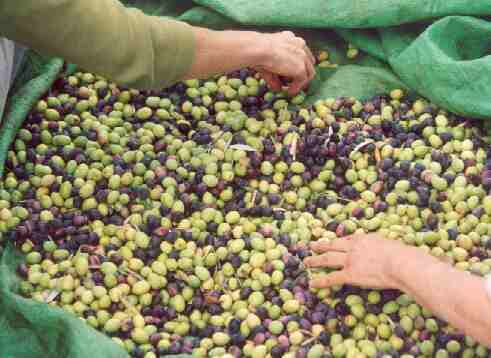 Palestinian farmers are too frightened of violence and intimidation to pick their own crops of olives. International volunteers went to Palestine to try and ensure that they could pick in safety and to demonstrate to the Palestinians that, even if the world’s politicians ignored their suffering, there were still people in the world who cared. Israel clearly intends to annex the ‘occupied territories’ of Palestine permanently. Why else would they bankrupt their economy to build settlements and roads throughout the occupied territories? In addition they take 25% of their essential water from Palestine. Israel has flouted more UN resolutions than any other state. The Israelis are deliberately terrorising a population of 3 million people to achieve their objective. Every day they use heavy military equipment to kill innocent civilians; more than three times as many Palestinians are killed than Israelis! They impose curfews that are random and can last weeks, they tear-gas regularly and they have erected roadblocks that prevent freedom of movement. In every home we visited someone had been imprisoned without charge and tortured (sometimes horrifically). Israel is in contravention of many of the provisions of the Geneva Convention. The Israelis are destroying what is left of the Palestinian economy, through destroying factories and businesses, destroying the Palestinian administration’s premises, blocking transport and communication with roadblocks and denying access to water and electricity. Don’t believe what politicians say; look at what they do! 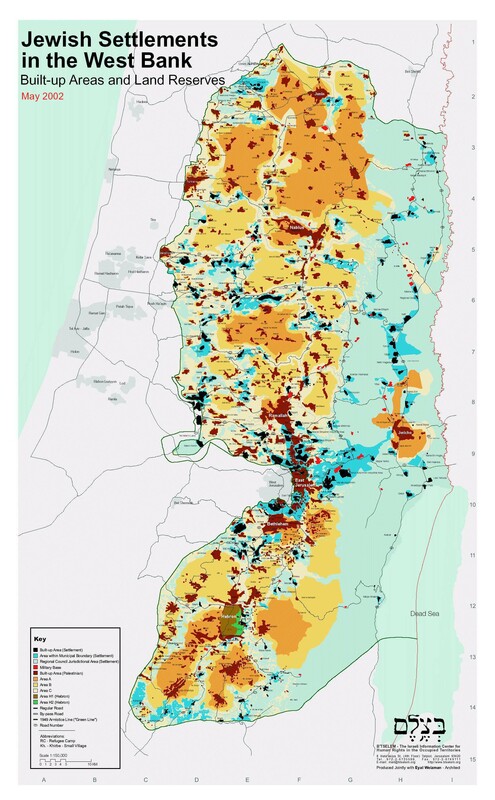 Israel has continued to invest heavily in settlements (colonies) to make occupation a permanent fact on the ground. America supplies the military equipment and especially the tear gas so widely used. Britain and most of the rest of the world is all wind, supporting UN resolutions but not doing anything to enforce them (except where America wants to). None of the above condones the attacks on Israelis by Palestinians, but I would have hoped the British would still be fighting for their freedom if the Germans were still in occupation of Britain so long after the last war (Israel’s first war was 1948 and the occupied territories were seized in 1967). I met some wonderful, brave and sensitive Israelis who oppose what their government does in their name. One key point they make is that most Israelis are unaware what is going on, fed by a media presenting the Israeli propaganda only. Palestine is a very hot and dry climate. 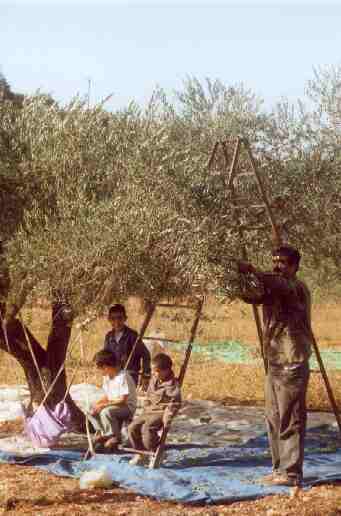 The one thing that does seem to grow is olive trees and they are a vital part of the agricultural economy and a symbol of their lifestyle. Cultivating the olive trees has become increasingly difficult with intimidation and violence from the army and especially from the settlers (really a small faction of settlers). Their intentions are primarily just to intimidate the Palestinians through violence, but also, if land is not tended for three years Israel automatically seizes the land, so if the Palestinians can be driven away, even more land is expropriated by Israel. The premise of all International Voluntary activities is that Israel is trying to hide what is going on from the rest of the world so that in general it will be restrained when Internationals are witnesses. Also where Palestinians can be arrested and detained without any recourse, Internationals have to be treated within the law and have the fallback of diplomatic pressure. In theory Internationals are ‘safe’! Our group of around 12 Internationals picked in an area called Salfeet district (the main town), an area of roughly 10 miles radius. Another organisation IWPS (International Women’s Palestinian Solidarity) had been in the area a few months and had worked with the villages and the local farmers Union to identify the trouble spots and arrange hospitality. We were briefed on how to bring in support from the army or police (but in practice used IWPS to organise this) and IWPS had established relations with the key administration personnel. Typically the trouble spots were close to settlements or roads and involved good walks across really magnificent limestone mountain scenery and terracing. We picked with families most of the time and if one ignored the threats it was a wonderful, relaxing holiday, out in the fresh air and sunshine doing quite gentle physical labour from around 6.30am to 3.30pm. Lunch was typically a superb spread of middle-eastern dishes and pitta bread, which would have cost a small fortune at restaurants back in the UK. 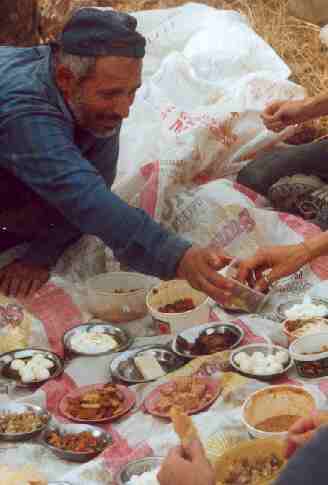 Evenings were usually with the same family for dinner, usually chicken and rice with chopped salad and yoghurt. In the Salfeet region the main threats were from settlers –probably a small faction- whose basic position was that all this land had been given to the Jews by God and that the Palestinians were just animals to be driven off their land. There are a range of Jewish sects that take this position and indeed claim that all the land from the Nile to the Euphrates belongs to the Jews (so they may not stop at the occupied territories of Palestine). In the absence of Internationals they will either simply abuse or threaten verbally (typical of land adjacent to roads where they just drive by and stop) or they will start stoning (the land has a superabundance of jagged stones!) or shooting at Palestinians to drive them off the land. Almost all these settlers carry guns permanently. Settlers can effectively do whatever they like without any redress from army or police who are there to protect settlers. Except for a few token trials no settler will be prosecuted whatever they do and so they act with impunity. Should they injure or kill a Palestinian then, without compelling evidence, it would be assumed the Palestinian had behaved aggressively, justifying the reaction. Whenever the army gets involves, they (at least in Salfeet region) simply try to stop the violence, usually by forcing the Palestinians off their land. They never force the settlers to go away nor do they restrict them physically. Only the police can arrest a settler. With the right negotiations, which can take days, the army will provide protection for Palestinians under the army’s terms of when and where. Army violence in the olive groves was limited to tear-gassing groves near their perimeters. 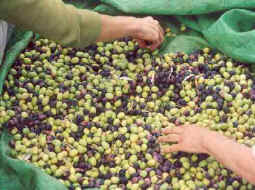 Because of international pressure they did eventually say this was a mistake and the olives were picked. In the villages the army is a much greater threat. They impose curfews and then use tear gas before people can clear the streets and in Salfeet they tear-gassed the Palestinians coming out of the Mosque after prayers on the first night of Ramadan. It took just 4 days to get me scared, so how the Palestinians cope is beyond me. After all we as Internationals are in little danger. Even settlers would be in trouble if they kill us. On the second day in the fields we were called to run quickly as the settlers were stoning and shooting at the Palestinians already out picking (typical Westerners up late)! We got there, formed a line between the settlers and the Palestinians and tried to negotiate and calm things down. The settlers were about 40 feet above and away from us throwing big stones which gathered pace as they fell down. Because there were only 4 of them it wasn’t too difficult to watch each stone and move aside if it was near you, but sometimes when they landed on a rock and shattered the bits went everywhere. Eventually the army came and the settlers couldn’t throw stones because the Palestinians had been forced back, so they started shooting, not to hit anyone, just scare the hell out of them (this isn’t shooting in the air, it’s shooting to miss by a few feet). 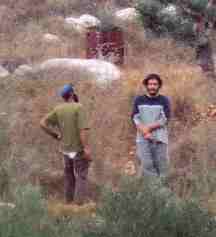 The army did stop that and called the police to arrest the settlers, but they were released of course immediately. The army forced the Palestinians of their land that day although the internationals stayed put –then it rained and it was a damp squib! Next day with prior arrangement with the army, the whole village turned out to pick in a difficult (large) region. 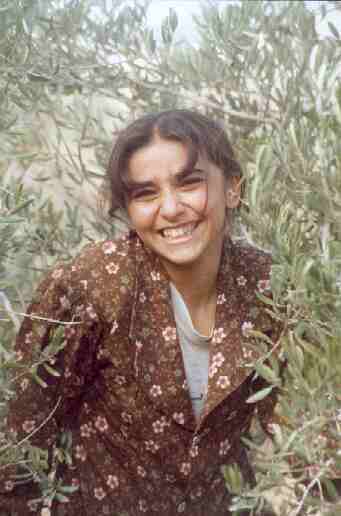 At least 200 villagers with just 12 internationals and perhaps 8 Israeli activists. The army had a token presence and couldn’t stop an attack by the settlers, which was limited to stoning and kicking at close quarters. Intimidating, but no serious injuries, but it demonstrated that we simply hadn’t enough resources to cover so many farmers. The setters smashed a TV camera with an iron bar. Eventually the army brought in more support, the settlers were moved away and a couple of hours later picking got underway, but still restricted from picking near the settlement. On day four, a small group of us went to help at a nearby village –Yitma (the army wouldn’t permit more picking at Yasuf that day). 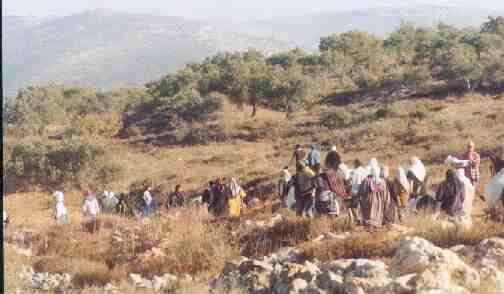 This time the settlers actually came with the army to drive the Palestinians off their land. All the army tried to do was limit the violence. The settlers all had guns and were trying to kick the Palestinians; I found I had to jump in between one settler kicking a woman and then run to rescue a child scared stiff of them. Then the settlers started upending the sheets to tip the picked olives onto the ground and overturn the sacks, all in front of the army! We did try and open a discussion with these settlers (naive still at this stage), which elicited the usual bigoted response. But the significant theme was that the settlers saw the Palestinians as animals, to be treated s animals and, since they were violent animals, justifying the settlers carrying guns to kill them. Next day we were picking just a few hundred meters from the day before, all seemed peaceful although we heard a bursts of gunfire from just over the hill, perhaps 10 minutes walk away. That night we were told 5 Palestinians had been injured by settlers who had driven along the road and shot. Then we heard that in a village called Yanoon, about 15km away, the settlers had driven 20 families out of their homes and burnt them to the ground. When I went I simply condemned all Israelis; after all they voted for this brutal government. Of course it wasn’t like that. No more than a few thugs in a football crowd mean that all fans are thugs. Our actions were helped at their most critical stages by the support of Israeli activists mainly under the group Rabbis for Human Rights. Travelling with them gave me time to get to know them and in every case they reflected the most socially conscious, compassionate and intelligent people one is ever likely to meet. Just one incident has to be recorded. During the big co-ordinated olive picking at Yasuf, with some dozen settlers, all armed with guns causing all sorts of violence I was watching and filming from the opposite side of the valley. Through my Binoculars I watched one white haired, older man tracking with a group of three settlers and engaging them in negotiations against violence. They had moved well away from any army surveillance. I watched horrified as one settler thrust his gun into the old mans chest and pushed him away, expecting at any moment to see an accident. Of course he just kept his cool and continued talking. Later I caught up with him and expressed my admiration for his courage. “Oh, that was nothing, he had the safety catch on and was just showing off” he said. He seemed to be at every confrontation after that, always at the forefront de-escalating the aggression. Violence is the Israeli preferred strategy. The state of Israel was born out of terror, driving the British out, then massacring Arab villagers to drive them out too. Then the war of 1948 to secure more territory than the UN allocated and then the big 1967 war to annex Palestine and the Golan heights. They invaded Egypt and then Lebanon. . They know that International pressure evaporates. They have escalated the violence progressively. I remember how the world objected to the first use of F16s on civilians. Now it happens almost daily and doesn’t receive any condemnation. Everyone who stands back and does nothing to oppose the Israeli terror is implicitly condoning it and carries a moral responsibility for it continuing. There’s an old quote about doing nothing when they came for the Jews, ending with there was no one left when they came for me! Everyone with a moral conscience should be prepared to make their views know politically and to lobby for a political solution. Do please contact me by email to support the Palestinian cause.